Sax player Lynden has been playing the saxophone for over 35 years and has been a full time professional player and teacher for more than 16 years. He runs his own award winning jazz duo and jazz band and has a huge passion for playing the sax. He has played at hundreds of top venues all over the UK including the famous Jazz club Ronnie Scotts in London and has played in hotels and clubs in a variety of musical settings all over the world. 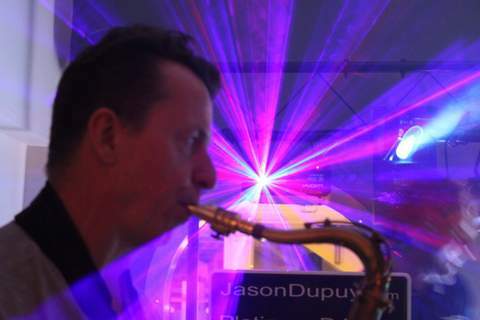 Playing the tenor or alto saxophone together with Platinums professional DJs is something he absolutely loves to do. Lynden has an amazing sound on the sax and is well known in the industry for his passion for music and his easy going nature. A solo sax player with live instruments backing tracks playing all genres of music from jazz, swing and latin music through to pop, soul and funk. A duo with female singer or female pianist/vocalist. A trio of sax, bass and piano. A four or five piece band of drums, double bass, vocals, piano and sax. Other combinations are also available, please just ask us! For more information about Lynden please contact us on 01322 412494 or send an email to info@platinum-djs.com. Would you like us to send you a quote? Please fill in your details here!